Hello everybody and welcome to natureword.com! Today, July 2, 2014, we celebrate the birth of natureword.com, a new and exciting health and wellness blog. 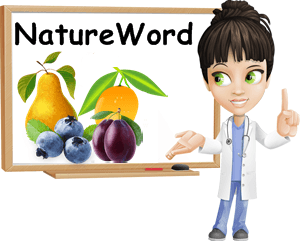 Natureword is dedicated to all things health and wellness-related and focuses on revealing the properties and health benefits of food items people from across the globe enjoy. Whether it’s pomegranate and figs, goat cheese and walnuts, cashews and flaxseeds, green tea or peppermint, coffee or chocolate, turmeric or basil, you need to know just how an item you may enjoy on a daily basis affects your health status and well-being. And natureword.com is here to tell you just that. Macronutrients, calories, antioxidants, dietary fiber, vitamins and dietary minerals are all relevant components of food and things to take into account when looking to eat and keep healthy. Daily requirements, side effects, warnings, medicine interactions and health benefits are aspects as significant to your well-being as eating itself and can make a great difference in your health status and quality of life. On natureword.com you will learn what to eat in order to boost your energy levels, what foods to avoid when dealing with a certain medical issue; you will read up on the newest health-related breakthroughs, discover fruits and vegetables from across the world, find out ways to improve your health, look more youthful, better understand healthy eating, nutrient functions and nutrient requirements as well as improve your mood and learn about all those healthy eating options that are out there for you. There are pictures, explanations and information based on solid scientific research, all of which aim to guide you towards a better life and inform you of all the healthy eating possibilities available to you. The user-friendly experience and flawless technical support is offered by Marius Lixandru, while the data and truth-abiding information is collected and presented in an intelligible manner and simple format by Ana Visanu. We are not medical professionals, not aim to offer medical advice. We are two people driven by our passion for healthy eating and motivated by our love for nature and simple living. Get to know us on our Info Page. Good health is the basis for a good life and knowing which foods are good for you and which you should avoid is pivotal in this respect. Even the humble potato, the constantly overlooked cabbage, the beautifully-scented peppermint and the pungent onions and leeks hide secrets that could turn one’s health around. And natureword is here to expose the truth about our food, whether pleasant or painful, so you are better equipped to make the right dietary and lifestyle choices for you. Accompany us on this wonderful journey that questions everything you’ve been told about healthy eating and healthy living up to this point in your life. Welcome to natureword.com!